Description of intermolecular interactions in excited states. Why studying the technical physics is a good choice? What are the career possibilities? Information and learning materials for students on courses run in the Institute of Physics. Institute of Physics comprises of six reseach groups that work in the fields theoretical, experimental, and computations physics. Institute of Physics aims to present the sciencie to the general public. We invide schools and all the passionates of physics to learn about our popular science offer. Scientific Bulletin of the Lodz University of Technology: Physics publishes accounts of original research as well as review articles concerned with all aspects of physics. 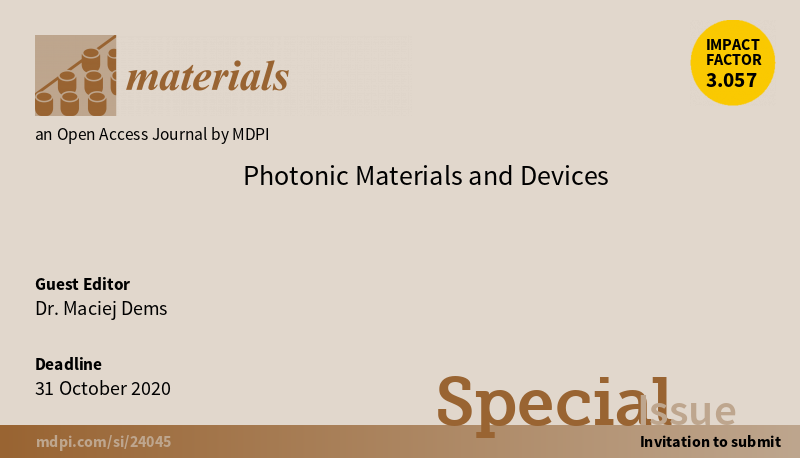 It is my pleasure to invite you to submit a manuscript to the Materials Special Issue on Photonic Materials and Devices. We are particularly interested in original research on natural and artificial materials with a broadly understood application in photonics on the modern photonic devices. In the period of 14-17 November students from Technical Physics and Science & Technology attended the 9th International School on Nuclear Power organized the National Centre for Nuclear Research in Świerk. We have a new PhD! Our colleague Koushik Chatterjee has just defended his PhD thesis in chemistry. The subject of thesis are new computational methods for quantum chemistry and it was completed in the Institute of Physics under the guidance of prof. Katarzyna Pernal. Instytut Fizyki is part of Faculty of Technical Physics, Information Technology and Applied Mathematics of Lodz University of Technology.